Optoma announces new true wireless in-ear headphones | What Hi-Fi? The NuForce Be Free8 are in-ear, noise-cancelling cans with aptX Bluetooth support. True cord-cutting is a tough game, but an increasing number of companies are getting in on the action. There's the Sony WF-1000Xs, which are a 2017 Best Buy Award-winner, there's Google's Pixel Buds, and - of course - there's Apple's AirPods. But now Optoma has entered the arena with its newest wireless headphones, the NuForce Be Free8. So what are the specs? Well, they have AAC and aptX support for 'CD-like' sound, and a battery life of four hours (with the charging case giving the headphones a total of 16 hours of life). 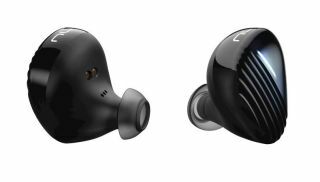 The Be Free8 also have noise-cancelling capabilities, which will be useful for runners who don't want the outside world to break in over their tunes, and there's a button on top of the earpiece for playback control and activating smart-assistants like Siri and Google Assistant. Should you be caught in the rain, these headphones will remain safe too - they have a IPX5 rating, so will resist damage from rain and sweat. Prices start at £200, with retailers listing them as available to buy now. Spiritland opens Headphone Bar showcasing "world's finest portable audio"
Alien earbuds: out of this world true wireless sound for tight budgets?